A nutrient dense and healthy kind of cookie dough that makes dessert extra sweet – especially with a scoop of vanilla kefir ice cream on top. This creamy parfait is made with ingredients that are actually good for you: we won’t judge if you go for seconds! 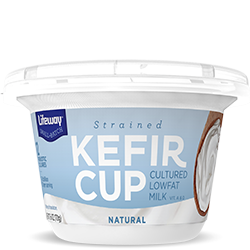 Add kefir cup, kefir, banana, and vanilla bean to the pitcher of a high-powered blender. Blend on high until smooth, or until desired consistency is reached. Pour into a container and freeze for 4 - 6 hours. Scoop, add toppings, and enjoy! Layer P.S. Snacks cookie dough and kefir ice cream. You can top with dark chocolate chips and enjoy!